Word 2013 can track many types of document changes, including insertions, deletions, moves, and formatting modifications. Here you’ll learn how to enable and configure how edits to a document are tracked and how revision marks appear onscreen. You also learn how to accept or reject revisions. By default, change tracking is turned off. When you turn it on, Word begins notating each change you make, using a standard set of marks, such as underlining for insertions and strikethrough for deletions. Open a Word 2013 document, and then choose Review→Track Changes. The Track Changes button becomes highlighted. On the Review tab, open the Display for Review drop-down list and choose All Markup. New in Word 2013 is the ability to show all markup or just certain types. For now, choose to see all the revisions. In the first paragraph, delete a word and type another in its place. The deleted word turns red and appears in strikethrough, and the replacement word appears underlined. Select a word to make it bold and press Ctrl+B to make it bold. In this example, Sir Richard Williams, was selected. A balloon appears to the right of the paragraph showing the formatting change. When you accept a revision, the change is incorporated into the document and the revision mark goes away. When you reject a revision, the change is discarded and the revision mark goes away. You can accept or reject each revision individually, or you can accept or reject all revisions in the entire document at once. In your document, delete a word and replace it. In this example, delete thirteen and type 13 to replace it. The change appears with revision marks. Click at the beginning of the first paragraph to move the insertion point there; then choose Review→Next Change, found in the Changes group, to move the insertion point to the first change (the deletion of British). Choose Review→Accept to accept that change. The next change is highlighted (the insertion of United Kingdom). The next change is highlighted (the deletion of thirteen). The next change is highlighted (the insertion of 13). The next change is highlighted (the bold formatting applied to Sir Richard Williams). A dialog box appears telling you that there are no more changes. The dialog box closes and the paragraph appears. If you’re confident about the revisions, you might want to accept them all at once. For example, if you made them all yourself, you might already know that they’re all valid changes. Conversely, if you want to discard all the changes at once (for example, if someone heavily edited a document and you preferred it the original way), you can do that as well. 1. Make some changes to your document. In the following example, in the first body paragraph, in the first line, 1980 was deleted and 1982 was typed; in the second body paragraph, 1914 was deleted and 1915 typed; and in the second body paragraph, Lieutenant Colonel was capitalized. 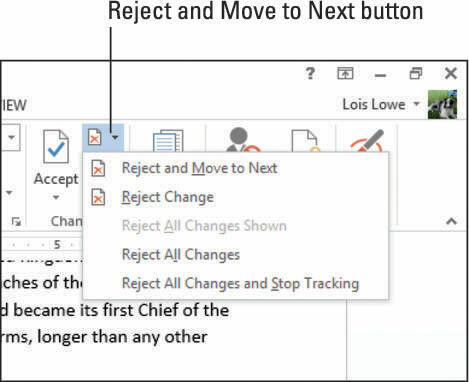 On the Review tab, click the arrow button next to the Reject and Move to Next button in the Changes group, and click Reject All Changes on the menu that appears. All the changes you made are reversed, and the revision marks disappear.